FILE - An electronic voting machine and a ballot box are seen inside the Congo's electoral commission (CENI) head offices at the Gombe Municipality in Kinshasa, Democratic Republic of Congo, March 1, 2018. Jean-Pierre Kalamba waved his hand over a map of the Democratic Republic of Congo, the Central African nation that has delayed elections for two years since the president, Joseph Kabila, refused to resign after his term ended in 2016. Kalamba, an election official, said the government is struggling to raise the $1.8 billion the electoral commission says it needs to run the next poll, set for December 23. The commission's budget goes through the legislature, controlled by Kabila's party — the same people the opposition accuses of delaying the elections. He added, mistrust between politicians is at fever pitch, nearly every step the commission takes is scrutinized and criticized. Kalamba said bogging down the process is that Congo is the size of Western Europe, has few paved roads, low literacy levels, and chronic insecurity. He said thousands of candidates are vying for a slice of power, and the 2011 ballot was 53 pages and weighed more than 300 grams. Anger against the current administration recently bubbled up in city streets, and the government's harsh response, which left at least six protesters dead, has further inflamed tensions. 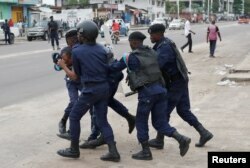 FILE - Policemen detain a protester after the Sunday Mass prayer in front of Notre Dame Cathedral in Kinshasa, Democratic Republic of Congo, Feb. 25, 2018. "We encourage the political process to be open to all and call for citizens to be allowed to assemble without fear of violence or arrest," U.S. ambassador to the United Nations Nikki Haley said earlier this year. But even with election officials saying they're confident they can hold the poll on time, it is likely to be complicated and contentious. Kabila won the 2011 poll, which was criticized by international observers for alleged rigging and violence. This time about eight million people are first-time voters. Young people have been a visible component of anti-Kabila protests, and in the capital, every young voter VOA encountered spoke of change. But Kabila's People's Party for Reconstruction and Democracy says it's confident of winning the youth vote. "It's a party that empowers youth, and it's a party that has a rather clear vision of the role youth should play in the development of our country," presidential aide Patrick Nkanga told VOA. FILE - Protesters pray in front of policemen in front of Notre Dame Cathedral in Kinshasa, Democratic Republic of Congo, Feb. 25, 2018. About of half of Congo's population is Catholic, and the recent Church decision to throw its support behind anti-Kabila protests has ratcheted up tensions. The church has long provided services the state often fails to provide, like schools and medical care.Church leaders mediated a 2016 political agreement that called for Kabila's resignation and elections in late 2017. And so, Priest Come Tshamala said he is telling churchgoers Kabila needs to go. Parishioners have embraced the message. At Saint Francois de Sales parish, congregant Paul Buka says political leaders violated the people's trust by reneging on the church-mediated agreement, giving the faithful no recourse but to protest. But that has come at a price.At his parish, choir director Manu Bakutu said he watched as his friend, 24-year-old trainee nun Therese Kapangala, was shot by police and died on the street outside the church "in a pool of blood." Her death, he said, has turned her into a symbol of non-violent resistance. Opposition parties are gearing up to draw votes, but cynicism shines through their rhetoric. "We are the party of hope," Vital Kamerhe, leader of Union for the Congolese Nation told supporters at a Kinshasa rally. But he told VOA afterwards, that hope doesn't extend to faith that the poll will be fair.He noted the electoral commission's Korean-made electronic voting machines are plagued with malfunctions. 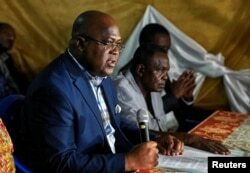 FILE - Felix Tshisekedi, leader of Congolese main opposition the Union for Democracy and Social Progress (UDPS) party, addresses a news conference in Limete Municipality of Kinshasa, Democratic Republic of Congo. Top opposition leader Felix Tshisekedi told VOA at his Kinshasa home, "The voting machines, for us, are cheating machines. These implements are designed to let the candidate who is chosen by Kabila or by the legislature to fabricate a fake majority like they did in 2011." Much of the drama also centers around Kabila's next move. Last month, the nation's communications minister told VOA's French service Kabila would not seek another term. Instead, Lambert Mende said Kabila will announce the name of his chosen successor in July. But it's that very style of top-down leadership the opposition says needs to end. Nkanga, the president's aide, says it won't play out like that. "The next president will be chosen by the people," he said. "So we can't say who it might be, right now." But as Kalamba, the fatigued election official said, mistrust overshadows every step of the elections. When asked whether he thought Kabila might make an appearance on the 2018 ballot limits, Kalamba grew quiet and sighed.